Microsoft may have started a trend with last years May the Fourth SharePoint event where they released the SharePoint Framework, following it up with the SharePoint Virtual Summit today. Adding to some of the announcements that were made at Build last week SharePoint, OneDrive and yes even Yammer saw some announcement love today in a two hour special from Redmond. Just as the web stream started rolling, some of the Office blogs were being published and these are well worth a quick scan to catch anything that I’ve missed in my summary here. 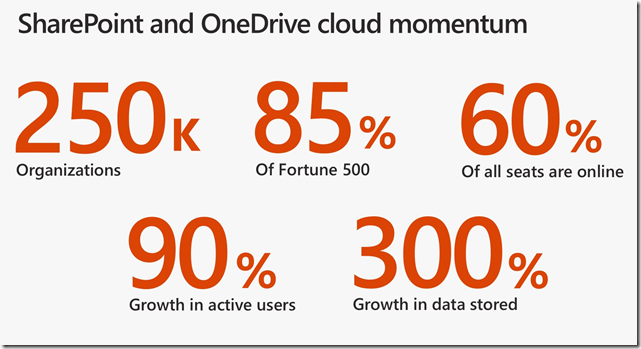 During the Keynote, Seth Patton touched on the current success levels being experience by office 365, with over 100 million monthly active users across the platform, 85% of the fortune 500 companies using it and a 300% growth in data stored. 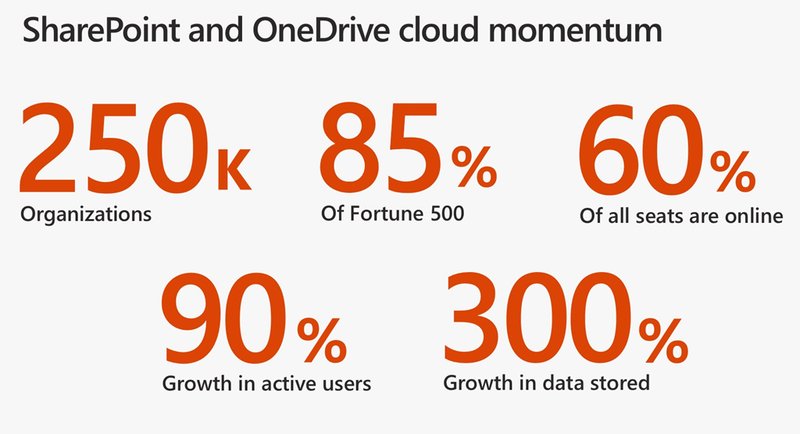 These figures show the quite phenomenal growth of Office 365 over the past year and an often commented phrase heard during the presentation was that security in Office 365 was better than most organisations, prompting the suggestion that the concept that cloud was unsafe was out of date and that companies should challenge the Elephant in the room when it comes to security (the elephant comment came up during the panel discussion at the end of the show). Before digging into the rest of the content that came from Jeff Tepers presentation, it was great that he called out the community on it’s contributions to SharePoint and Office 365, acknowledging that whilst Microsoft wrote the software,we all contributed by engaging with MS at all levels. As a long time member of the SharePoint community and having now been a speaker for about 6 years on the SharePoint Saturday circuit it was great to see this shift in focus that Community matters. It was prevalent last year at the May 4th event and just as visible today. This engagement in the community is also highlighted by just how many community events that Jeff Teper attends and provides keynote contributions for, supporting the work done by organisers of these events all around the world. For me though, I was mostly interested in the technical improvements across SharePoint and OneDrive for Business. The team certainly didn’t disappoint us with more great information about the OneDrive files on demand feature that was initially unveiled at MS Build last week. Put simply there will be a new Windows 10 implementation of the OneDrive for Business sync client that will make all of your OneDrive for business files available on your device, without using any storage. You’ll be able to browse all of the files, and choose which files and folders to take offline. if you choose not to take them offline then you’ll still interact with them directly in the explorer window but you’ll be interacting with the online version. The next awesome improvement is the ability to share these OneDrive for Business files with users in and external to your organisation from WITHIN the windows explorer! All the policies that are configured within the OD4B administration site will be reflected here in Windows 10. Naomi Moneypenny touched briefly on the OD4B admin site, I didn’t notice anything that we haven’t seen before in the admin console, but it was great to see those policy changes being reflected swiftly in the explorer connectivity. We should be seeing this come to the Windows Insider program this summer, with a view to it being in general availability by Autumn 2017. Not announced during the presentation but discussed in the chat window alongside was the fact that the new app will allow On-Demand access to Team site data but there aren’t any plans to bring Files on-Demand to on-premises servers. Some of the announcements around Groups, SharePoint etc were reiterations of info that we’ve heard before. SharePoint Sites will be getting groups, Groups will be getting Sites, Yammer groups will be getting sites and everyone will be getting planner. We’ll get the ability to connect existing SharePoint team sites to Office 365 groups. The bigger announcement was around the integration of all of these things. For instance you’ll be able to add a Group Calendar web part to the SharePoint team site, you’ll be able to embed the yammer conversations into the site and the navigation experience between all of the elements that make up groups will be less disjointed with the removal of dead ends that currently confuse users. Support for adding SharePoint pages as tabs in Microsoft teams and integration options were discussed although more information is expected to be released at Ignite later this year in Orlando. All of the above is covered in some depth in “Personalise team sites in Office 365 and amplify teamwork using MS Teams and Office 365 Groups” including a Microsoft Mechanics demo showing some of the new features. Some of the nice improvements that I’m looking forward to playing with are the theming and site design options that will allow the ability to provide group site templates when creating groups for your organisation. The personalisation features should be coming to First Release this summer with the Teams page integration following later in the year. One of the biggest announcements for me is that PowerApps will be the unified forms story that we were kind of expecting it to become and PowerApps for SharePoint lists will be available from Summer this year. It’s certainly not 100% fidelity with InfoPath when it comes to Power of customisation, but for building beyond the basic SharePoint list form and enhancing your forms with enriched data like Maps and content controls then it’s a great no-code improvement. Building on the PowerApps experience was of course flow, with the implementation of simple approval workflows into SharePoint lists and libraries. Chris McNulty digs deeper into some of these List and Library improvements in a blog post on Techcommunity here. Possibly the biggest announcement for me is the release of what MS have dubbed “SharePoint Communication Sites” and are the clear replacement for the publishing sites of old, allowing organisations to create clean mobile ready sites that look great regardless of the device that the user is viewing them on. Coming this summer to first release, communication sites will hopefully be the answer to what a lot of companies are crying out for, a simple to use Intranet model that allows fast simple creation of content with minimal customisation requirements. To help support these new sites, new web parts and layouts will be delivered (Unfortunately no word on whether we’ll be able to customise these layouts as yet.. but I’m asking!) along with drag and drop authoring and yammer integration. More information can be found in this blog from Mark Kashman on Techcommunity. Some of the new layout options and web parts available as part of the communication sites release. Coming later this year (Q4 2017) is an improved SharePoint admin experience with a new admin centre in Office 365. Presenting a service health dashboard that focuses on the needs of SharePoint administrators and more importantly will provide an interface that allows the SharePoint administrator the ability to manage and maintain Sites that are created by Office 365 groups (a long awaited improvement). Further information on the new improvements to SharePoint administration can be seen in the blog post by Bill Baer on the TechCommunity site. General Availability of Bring Your Own Encryption keys is coming very soon to office 365. MS Flow in OD4B by tail end of 2017. Feature Pack 2 is coming to SharePoint 2016 on-premises in the Autumn. Don’t expect feature parity with O365, the focus is the developer model. So expect SPFx but NOT the latest features seen today. More details on everything at Ignite in September!